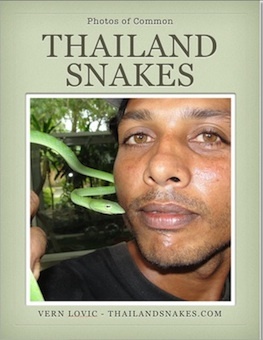 The golden tree snake is one of the most commonly seen snakes in Thailand. Their favorite food appears to be tokay geckos. Here a reader, Scott Mallon, took photos and a video of this hungry snake (Chrysopelea ornata) getting ready to enjoy his favorite meal. Golden Tree Snake - Copyright, Rich Lindie, used with permission. Another reader submission – Rich Lindie found this near his apartment in Bangkok, on a palm tree it appears. These golden tree snakes are very common all over Thailand. 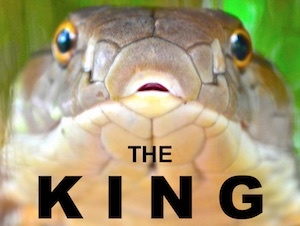 In fact, they might be Thailand’s most common snake. They are often found in the leaves of palms, and climbing up the trunk of palm trees. They also love vines and sometimes fences. These snakes have a diet that consists of nearly everything that moves – but they really love geckos, and in particular – the big Tokay Geckos. 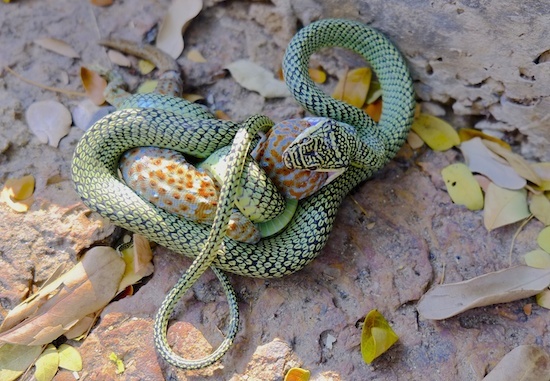 These snakes bite quickly – but their venom is not very toxic to humans. 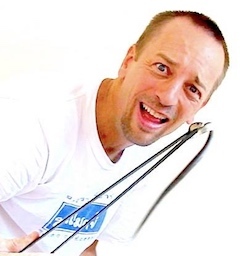 I have been bitten numerous times by these snakes, and as long as you don’t let them hold on and clamp down for a while – the venom shouldn’t affect you.